Pelvis and hip anatomy. 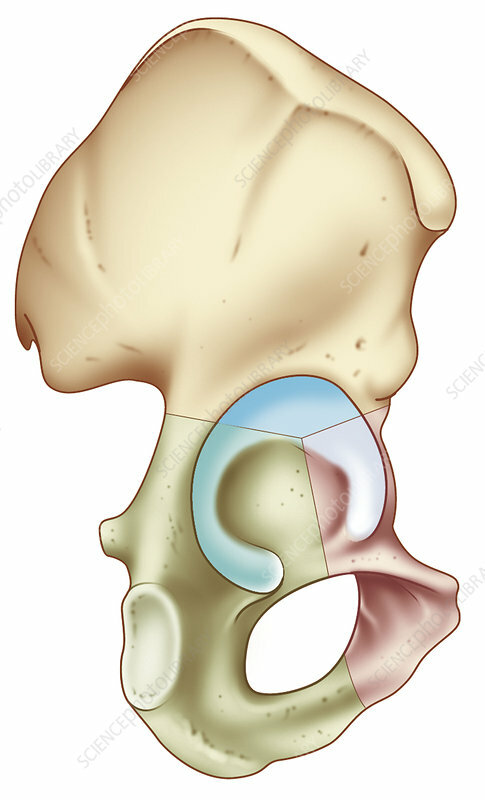 Artwork of a lateral view of the bones of the right-hand side of the pelvis and the right hip joint. The front of the body is at right. The acetabulum (blue) is the socket part of the hip joint where the pelvis articulates with the thigh bone (femur, not shown). The pelvis bone (innominate bone) is formed from three bones fused together. The largest of these, the ilium, forms the wing-shaped area (top). Below this, red lines mark the boundaries with the other two bones. These are the pubis bone (red) and the ischium (green).